Old & New Media: Why can’t we work together? 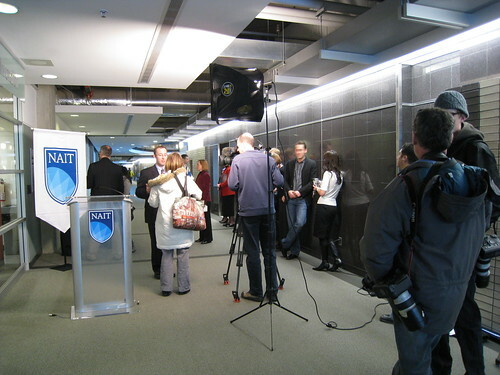 This morning I attended a press event at NAIT where the winner of the 2008 novaNAIT challenge was announced. Congratulations to Stephane Contré who won first place with his crime forecasting software. You can read more in my post at Techvibes. Not word-for-word, but that’s the gist of it. I’m not sure who he is or which organization he’s from, so his job is safe (not that I’d name names anyway). If I were his boss however, I’d have fired him on the spot had I overheard that remark. He clearly doesn’t get it. Why wouldn’t you put this story online? Give me almost any topic, and I’ll find you a community of people who care about it on the web. That’s one of the greatest things about the web – it makes it easy for small, geographically separated groups of people with similar interests to come together. And when they do, they’re not so small anymore. Anyway, I don’t know what he was talking about. Technology and entrepreneurship, especially together, are topics that tons of people care about. Such as the community of people that read Techvibes. Here’s a better question – why bother sending that camera guy for a story like this? I arrived with a point-and-shoot and my Flip video camera. The media guys all had DSLRs and large fancy video cameras, complete with lighting and microphones and other equipment. Obviously they acquired some higher quality content, suitable for broadcasting, but one camera could have done that – half a dozen wasn’t necessary. Heck, give one guy a Nikon D90 and he could have recorded high quality stills and HD video for the evening news. It seems like an incredible waste of resources the way news is gathered now. Basically, what many people have been saying became real for me today. Local media organizations should be doing what they do best, and linking to the rest. This wasn’t a “breaking news” kind of story – why not let the citizen journalists gather the news and use the organization’s resources for something else? Why can’t we work together? Of course, most local news organizations don’t know the meaning of the word link. They can’t even be bothered to hyperlink the URLs they include inside their own stories! Here’s the funniest part of all this. This story will probably get a sixty second spot on the evening news, and the folks who are interested will fire up Google to find out more (I remain unconvinced that anyone uses those annoying “links in the news” sections of TV station websites). And guess where they’ll end up? Potentially here, and definitely at Techvibes (and they can then follow a link to all my photos and videos from the event). Heck, four of the top ten results in Google for “novaNAIT challenge” were created by me and all I did is write a couple of posts and upload some photos. So, thanks in advance camera guy!